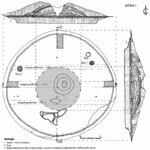 A complete study of the assemblage of four mounds near the earthen fortification facility in Kabayuk excavated by R. Rashev was published in 2014. The researchers’ attention focused specifically on a burial under one of the barrows. It is a burial of a young aristocrat buried with an abundance of luxurious grave goods in accordance with the pagan ritual. The authors suggest that the burial dates back to the very late 7th or very early 8th century, and the barrow dates back to the early 9th century. Recently, St. Stanilov has argued that these results provide strong evidence supporting the argument about the functioning of a royal residence at this location form the late 7th and the early 8th century. This allowed him to defends the traditional view that Pliska, which is situated ca. 15 km away from it, has emerged as the center of the First Bulgarian Kingdom during the reign of Khan Asparukh (in the years after 681). This article reports the results of a critical comparison of the burial and barrow assemblage, which concludes that there is no clear chronological difference between the two archaeological structures. The burial preceded the barrow assemblage, and its location was carefully hidden. The four barrows were accumulated immediately after that in two stages. The barrows were smaller during the first stage, and barrow 4 covered the burial whose grave pit was cut into the bedrock. Pits and ovens were made at the periphery of the barrows. They were used for preparing ritual meals and grave goods during commemoration ceremonies. Following the completion of the funerary and commemorative ceremonies, the covers of the barrows were finalized. The author believes that the assemblage cannot be dated earlier than the beginning of the 9th century. A parallel can be made with similar assemblages in Pliska, the Fortification of Khan Omurtag on the Ticha River among others, all dating back to the first half of the 9th century. He believes that the four barrows in Kabayuk have important characteristics, but they cannot be linked to a ruler of the capital Pliska; it is more reasonable to link them to an inhabitant of a nearby earthen fortification. The author also reports the results of stratigraphic and comparative analyses used to establish the chronology of the grave good yielded by the burial under the barrow. R. Rashev’s conclusions that the barrows represent elements of certain activities form the early 9th century have been taken into consideration. Commenting on Rashev’s thesis and recent studies on the so-called Vrap–Velino group dated back to the 760s, the author suggests that the artifacts yielded by the burial are similar to others yielded by several individual burials excavated in the Pliska Field. The author believes that the earliest burials (such as burial 5 under barrow III, situated between Pliska and Madara ritual center) can be linked to the two important crossroads (crosswise and parallel) in the Pliska field. The field is situated between two territories: the Black Sea Coast and Dobrogea and the territory to the north of the Stara Planina Mountain, both densely populated with Bulgars in the 8th and 9th century. These finding allow to conclude that the currently available evidence does not support the argument of the existence of Pliska as an administrative and political center of the First Bulgarian Kingdom before the end of 8th century.